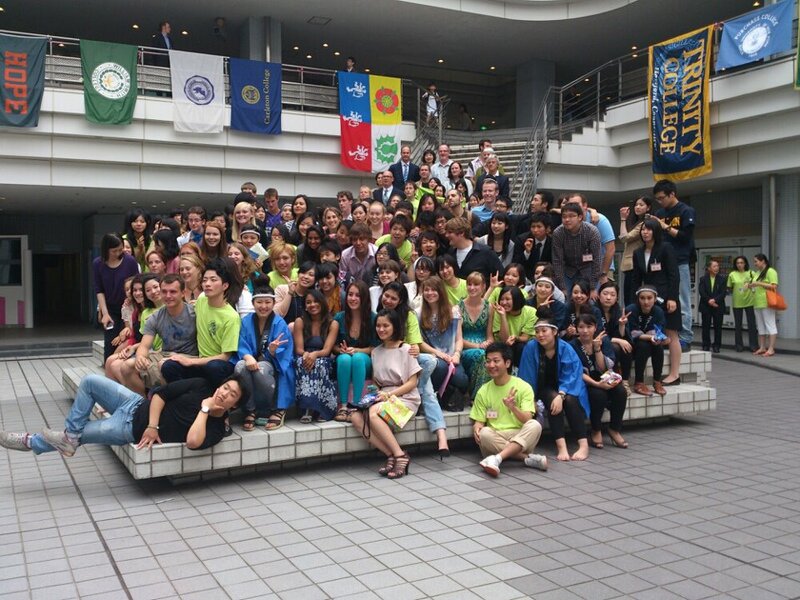 This is the picture that was taken at the Farewell Party of all of the participants! See you all later!!! This morning I woke up and ate a healthy breakfast full of fresh fruit! After breakfast, I walked to Technos College to participate in the “on-campus program.” Little did I know, the students of Technos College had arranged a Japanese style wedding. When I finished getting my hair done, the students had a perfectly fitted white wedding dress waiting for me. Needless to say, you can now call me Mrs. Imjuskidn! After I ate lunch, we played a game similar to musical chairs, balloon basketball relay, and a Japan trivia game. After the games, we had all received “medals” and a small gift. After leaving Technos College, we went back to the hotel for a bittersweet packing time. After we packed, we got a late dinner and then went to bed. Me (Brianne Funk) with my Wedding Hair finished! 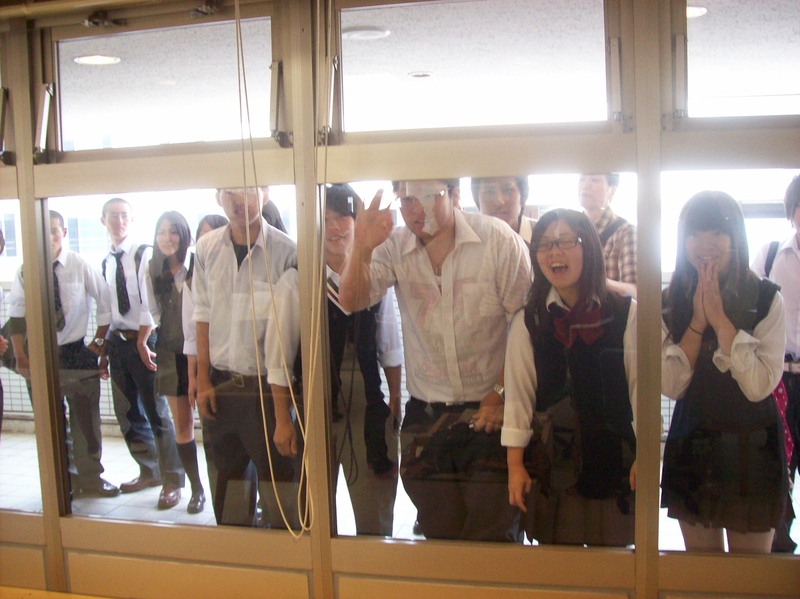 Students and bystanders watching from the window as I was getting ready for the BIG DAY!! This is me with the “perfectly fitted white wedding dress” on!! 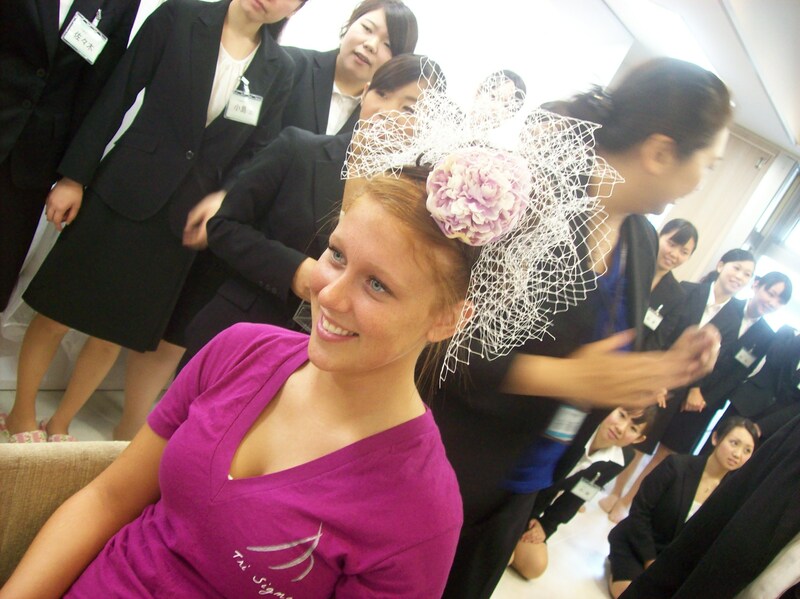 The people with me are the Japanese students who helped do my hair and get ready! This is me with my dress on sitting Japanese style! – Look in the background at everyone who was there to help me celebrate becoming Mrs. Imjuskidn!! Today, Kayla and I woke up late, missed breakfast and our bus to our museum. Whoops!! So we decided to make today still a productive day and explored the city. First, we went to go get breakfast from a local bakery; it was delicious!! After, we got the address to Harley Davidson and began what seemed to be the longest walk of our lives. Along the way, we found a Fire Station that my father wanted a photo of, but instead we not only got a picture of their truck, but also got a picture with their whole department, tried on their gear, and obtained an official “Tokyo Fire Dept.” hat. We conversed with the Fire Chief and other firefighters and then continued our journey to Harley Davidson to get t-shirts for Kayla’s family. As we were walking, we kept thinking that we were lost because we had not arrived to our destination yet. As we continued our walk, we asked several different people if we were close and they kept saying, “Yes. 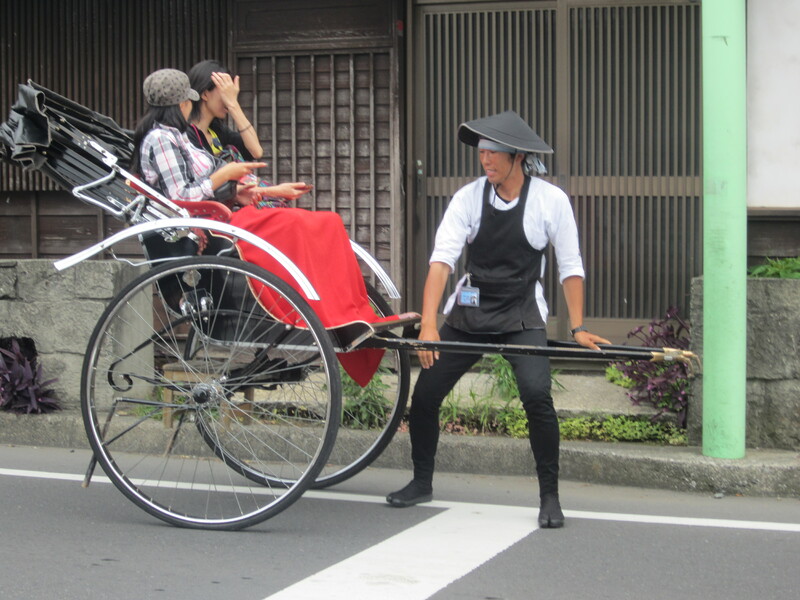 A little bit more up the street.” When we finally arrived to Harley Davidson we realized how far we were by the city we were in: Chofu – we walked 12 miles!! One way!! After we got our t-shirts, we headed back for the hotel on a 12 mile walk home. When we got back to the hotel, we ate a late lunch and decided that a nap was well deserved. When we got up from our nap, we went and got dinner in Fuchu, a city nearby. 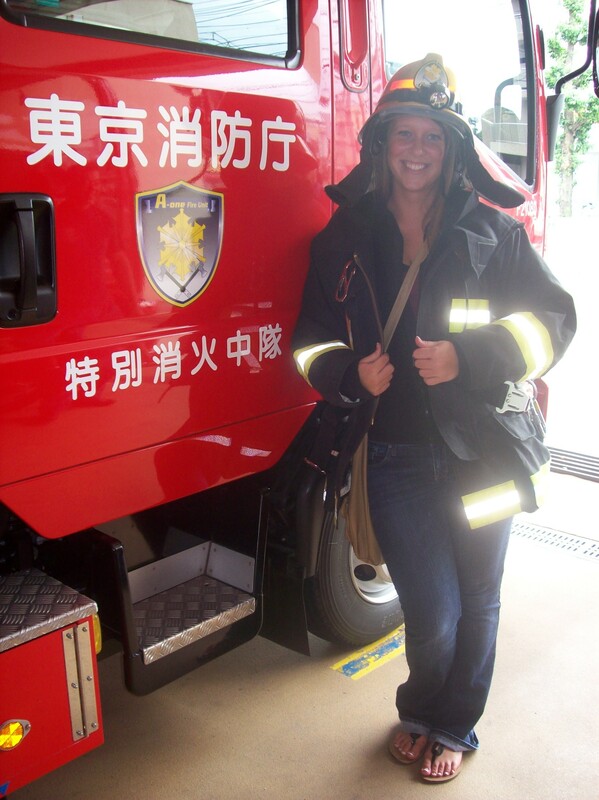 Me (Brianne Funk) with all the Fire Gear on at the Tokyo Fire Station on our way to the Harley Davidson Store!! 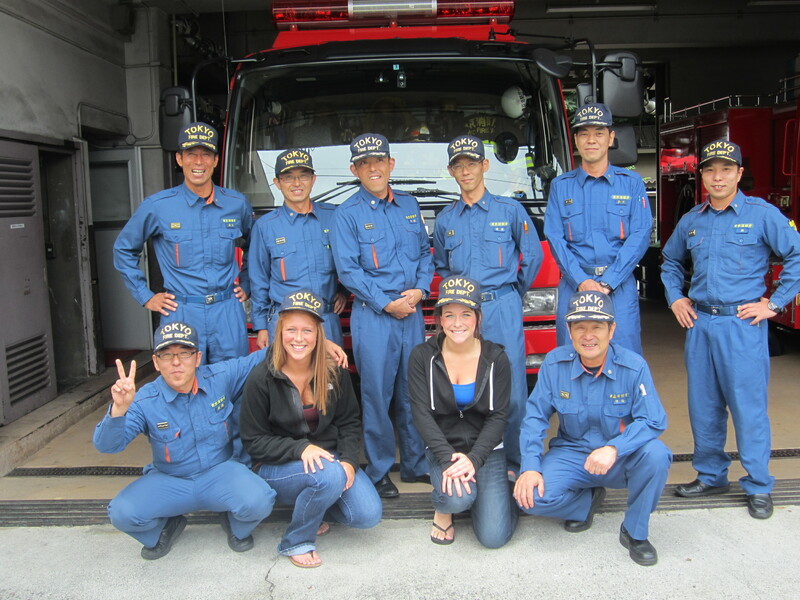 Kayla and I (Brianne Funk) at the Tokyo Fire Station with all of the Firemen on our way to the Harley Davidson Store! 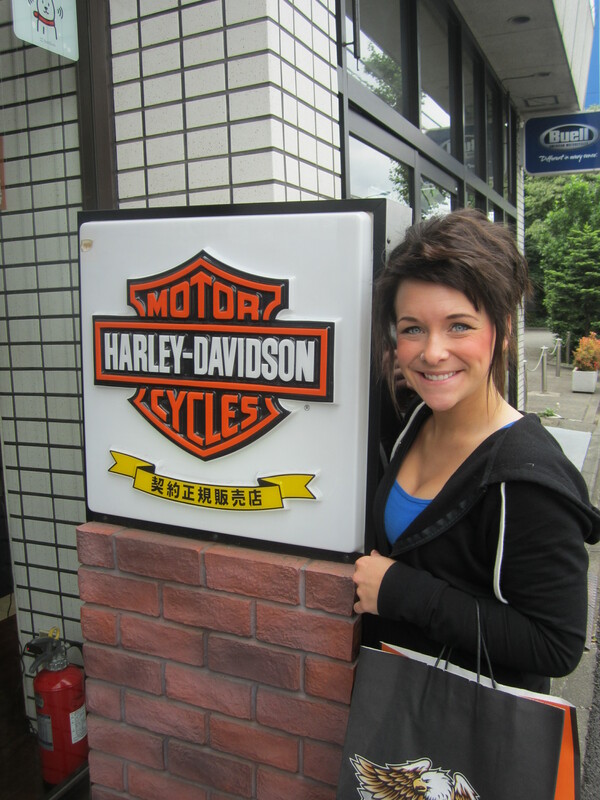 Kayla at the Harley Davidson Store in Tokyo, Japan: Chofu! Kayla and I woke up on time this morning and got a fantastic breakfast; they had amazing and so fresh of fruit, like always!! After breakfast, Kayla Morelan, Megan Inboden, and I walked to Technos College for our first day of an “on-campus program.” My program, which was different than any of the other students at McKendree because we were split into groups, consisted of going into a flight attendant classroom and seeing how they are physically learning their career paths. After, we ate lunch in their cafeteria and then met back up with our individual groups. My second “on-campus program” consisted of Japanese Dance. We were able to put on kimonos and learn a part of the Japanese Kabuki Dance that is performed as a ritual dance in Japan. The above picture is a picture of my Group in a Flight Attendant Classroom. This is me in a Kimono during my Japanese Dance Lesson! Kayla and I woke up late – about an hour late – and did not get to eat breakfast! We had to go onto the bus for Kamakura right away when we got done getting ready. We took our breakfast of champions with us – Cheez-It and Beef Jerky. When we got on the bus, we ate our breakfast and drove for two hours to get to Kamakura. When we got to Kamakura, we first saw a Temple that had a Buddha with eleven heads. After, we ate lunch. After lunch, we saw the big Buddha. For 20 yen, we got to go inside of Buddha. Inside of Buddha was so awesome!! At the end of the day, we had free time to go to the local shops along the street way. On our way to the street with all the shops, we saw these men that were pulling a buggy behind them with people on it, such as how the carriages in downtown St. Louis are, except with men pulling the buggy instead of horses. After our free time, we got back onto the bus to go back to the hotel. Our day was exhausting, so we got a take-out dinner to eat in our hotel room. 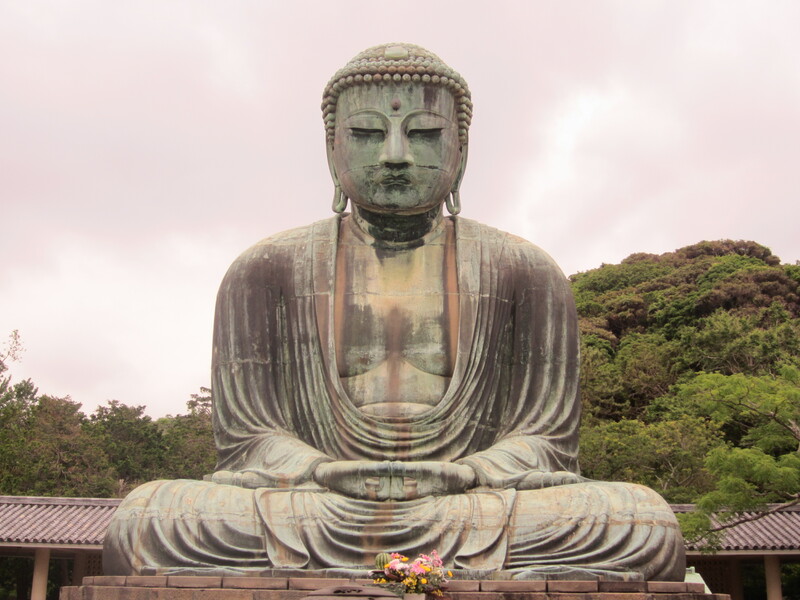 This is the Big Buddha that we saw at the Temple in Kamakura. This is a picture of the strong man we saw pulling the buggy behind him with people on it around the city. Today, Sunday, was our first “free-day.” We decided to attend a baseball game at Jingu Stadium where the Tokyo Swallows played the Lions!! The cheering, and even the concessions were much different than going to an American baseball game. Japanese are quiet during the game until they are up to bat – then they cheer with noise sticks and raise umbrellas when they score! – even the songs, dances, and cheers are much different; they have a different cheer for each player, as well as a song. 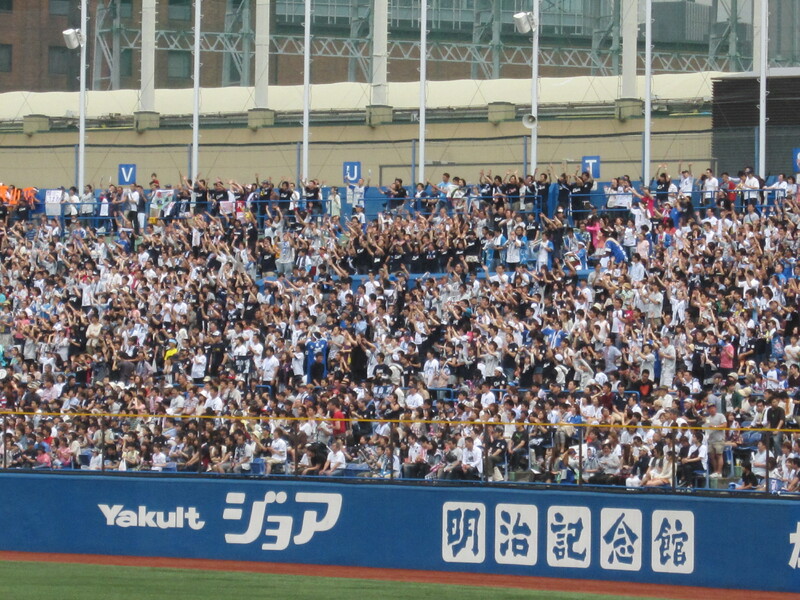 The above picture is the crowd cheering at the Baseball Game. 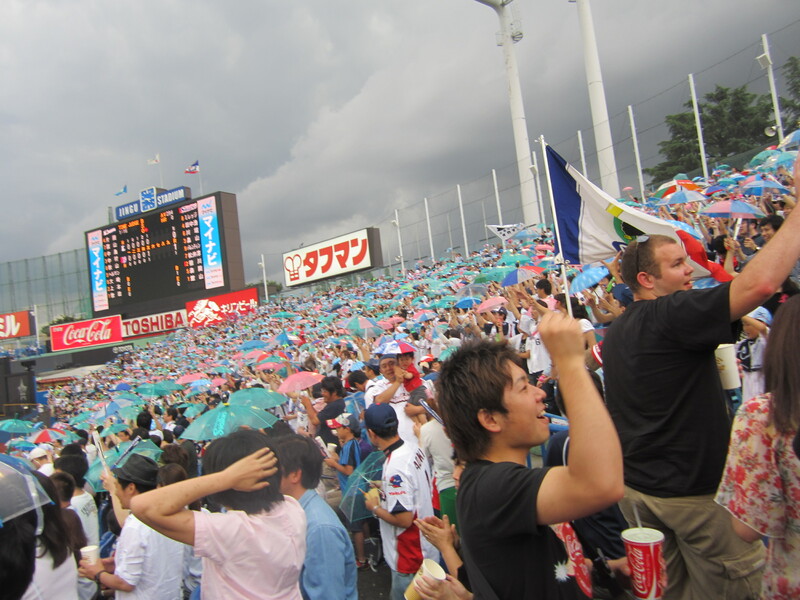 Every time the Swallows scored they would raise their umbrellas and say chants!! The cheerleaders they have at the game are very young (early teens) and the snack/concession girls – the ladies walking around the stadium while the Swallows and Lions played – were dressed in baseball uniforms carrying large coolers and “snack packs” on their shoulders; they looked like little dolls! During the game, I shared Pop-Rocks with the Japanese students – which they loved!! They said that they do not have candy like that here in Japan. It ended up raining, but the game still went on. The end score was Lions – 4, Swallows – 2.